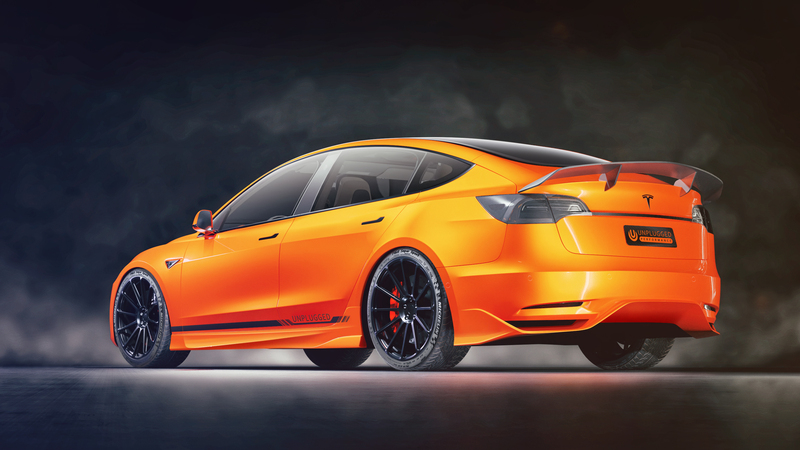 Los Angeles-based Unplugged Performance has released a rendering of a Tesla Model 3 dressed in a sleek aftermarket body kit and Ultra-light wheels. As tuners begin to stake their claim in the Model 3 aftermarket accessories market, Unplugged is looking to provide a more unique experience for the discerning owner by methodically transforming their Model 3 into an aggressive and sportier “Model 3 P” that has performance in mind. 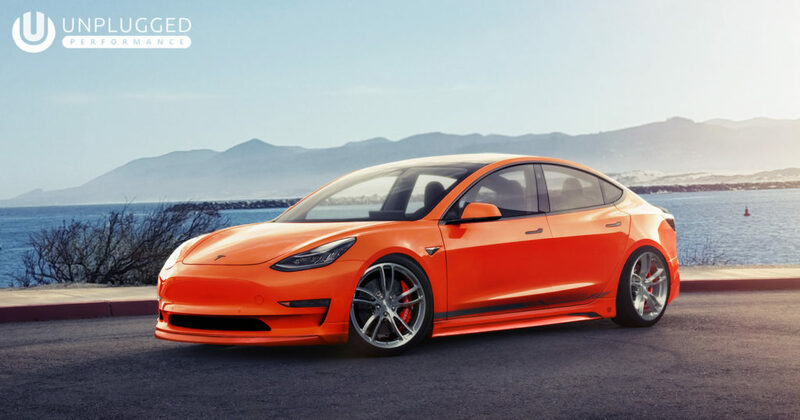 The company is offering a bespoke, low-volume Model 3 that will feature aero treatments, ultra-lightweight wheels and a ceramic brake upgrade through the company’s “Complete Car Program”. In addition to being able to purchase a loaded Model 3 with the company’s full aftermarket treatment, Unplugged Performance also said it will release parts individually. The company aims to have three separate Model 3 variants, with the “P” (or highest performing) version. Though Tesla will not be producing the dual motor Performance variant of the Model 3 until mid-2018, Unplugged Performance notes that they will be offering their own “P” version of the vehicle that will be outfitted with a multitude of add-ons, including carbon fiber treatments, re-tuned suspension, Ultra-light wheels with titanium lug nuts, and other made-to-order interior detailing. All of the coloring, carbon fiber detailing and even audio systems are also made-to-order. Pricing has yet to be announced. For some Model 3 drivers, the Unplugged Performance’s Complete Car Program and ala carte aftermarket bodykit upgrade could be seen as a way to add personalization to a car that has been characterized as elegance through simplicity. After the initial test drives by members of the media in late July, some claimed that the Model 3’s design was among its best features. While the Unplugged Performance body modification does provide a luxury twist to the Model 3, many owners may be just fine with the elegant design dreamed up by Tesla CEO Elon Musk and his team. What do you think? What aftermarket modifications do you plan to get for your Model 3, if any? Let us know in the comments below.